PJD you are hilarious with those faces. You hair is still gorgeous by the way. 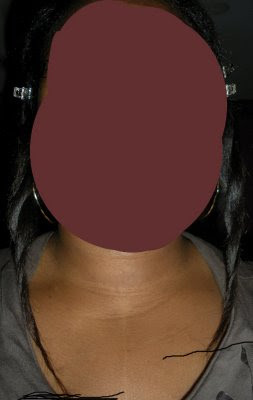 MY sister and I have always had problems with our hair growing evenly on both sides, we just try to style it in such a way that doesn't make it so noticable. You hair is SOOOOO shiny! Thanks for sharing! MRs. YF thanks Diva YOUR hair is too fab.Frugalista thanks I ahd just washed it the day before and I used a nice my honey child hair mask called Honey hair mask. I also use the intensive moisture treatment from Komaza. I posted on these products before but I mixed them up and slathered them on my hair to reveal shiny hair. I showed the scalp because I will soon start my Bee mine growth test to see if it grows my hair. Girlllllllllllllllll you know how i feel about your pics and your hair! Wow! You're hair is fab! I'm going to review your previous posts and slap everything you've used in the last six months on my head! 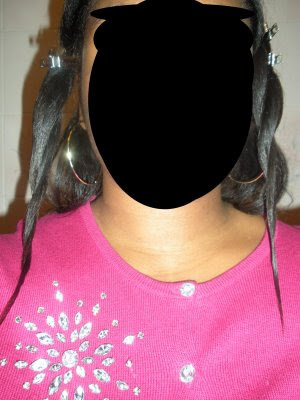 LOl PBW you are too funny, your hair is lovely as is. I adore your cut. The post on the vaseline clinical therapy is why I LOVE this blog.